Are you a student looking to gain experience in Internet Security, including SSL/TLS, cryptography, MQTT, SSH, and TPM 2.0? wolfSSL is one of the leading producers of Open Source Internet security products, securing over 2 Billion active connections on the Internet today. The wolfSSL “Summer of Security” program is a Summer internship in Bozeman, MT and Edmonds, WA which spans the Summer months and brings qualified students on-board to learn about how security software is written, tested, and used around the world. The Summer of Security program allows wolfSSL interns to gain knowledge in the embedded SSL/TLS industry as well as valuable programming experience in Linux and embedded systems. Throughout the Summer, interns will play a role in improving documentation, current examples, test cases, and community support within wolfSSL and related products. 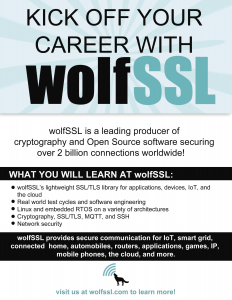 The Summer of Security is a great opportunity for students to increase work experience in the field of Computer Science and work towards a potential career as part of the wolfSSL team. The team at wolfSSL looks for knowledgeable students who have experience in C programming. Prior embedded systems experience, network programming experience, and familiarity with git/GitHub are a plus. If you are interested in learning more about the wolfSSL Summer of Security internship program, please send a resume and cover letter to us at facts@wolfssl.com!